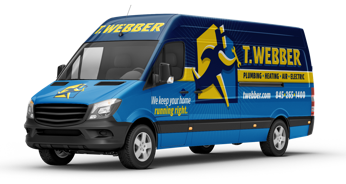 Electrical Solutions for a Safer Home - T.Webber Plumbing, Heating, Air & Electric. T.Webber’s expert Electricians can help secure and safeguard your home through the installation of smoke detectors, carbon monoxide detectors, security camera systems, and outdoor security lighting. Smoke Detector Installation: On average, 8 people die in a home fire each day in the U.S.—almost 3,000 people every year. To ensure your home is protected, smoke alarms should be installed in every bedroom, outside each sleeping area, and on every level of the home. Hardwired smoke alarms with battery backups are considered to be more reliable than those operated solely by batteries. Our technicians can repair and install reliable, hard-wired smoke detectors to help protect your home and family. Carbon Monoxide Detector Installation: Every year, over 200 people in the United States die from carbon monoxide (CO) poisoning. Several thousand more are treated in hospital emergency rooms for treatment for CO poisoning. For maximum protection, CO alarms should be installed on every level of your home and outside each sleeping area. Our technicians can repair and install reliable, hard-wired CO detectors to help protect your home and family. Security Lighting Installation: Webber’s Hudson Valley Electricians can design and install a security lighting system that both looks good and provides added safety and security to your home. From illuminating dark entryways to deterring intruders from entering your backyard or patio, our Electricians can recommend and install a solution to meet your needs and budget. Our security lighting solutions include both motion-activated security lighting, floodlights, and more. Security Camera System Installation: Our licensed and insured Electrical technicians can install hardwired security cameras to enhance home security and give you peace of mind. For prompt professional electrical service throughout the Hudson Valley, call T.Webber Services. We’re already in your neighborhood!